In 2016, Back Country Horsemen of America from 31 different states logged over 341,502 volunteer hours with just over 13.4 million dollars worth of volunteer value. In the process, 11,461 stock were used and volunteers traveled over 1.9 million miles. That adds up to an amazing 4,773,583 hours donated over the last 21 years, for a total donated value of $139,805,692. As they have from their inception, Back Country Horsemen see the challenges and make themselves part of the solution. 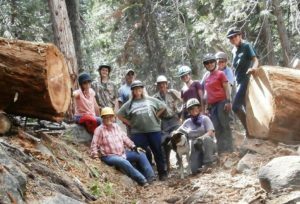 The Caples Creek Equestrian Trailhead project is one example of the work accomplished by Back Country Horsemen on a regular basis. Their goal: to provide a staging area for packers and equestrians to access the Eldorado National Forest. They chose a site conveniently located on Silver Fork Road, along the North Fork of the American River, across the Fitch Rantz Bridge from the hikers’ trailhead. As with much of their work, this was a long-term project accomplished by a firm commitment to several stages of construction. In 2011, the Mother Lode Unit of Back Country Horsemen of California studied the site and started the approval process. In 2013, the site was surveyed and graded, and Back Country Horsemen of California built a trail extension to the new trailhead. In 2014, twelve parking spaces were graveled and a trail bridge repaired. In 2015, BCHers installed the official trailhead sign, two bulletin boards, two hitching posts, and improved the picnic area. Finally, in 2016, they installed a gravel durable surface on US Forest Road 10N94 and a cul-de-sac designated for day use. In addition to dumping and spreading gravel, the project also included three days of tree trimming and drainage repair. The presence of meat wasps made the work especially challenging. Several volunteers were stung when the wasps aggressively invaded pant legs, gloves, and long sleeves. The project team faced another special challenge: the waterway had recently been designated a habitat for the endangered yellow legged frog. Past projects had depended on a water truck parking on the embankment to draw water, but this would damage the fragile habitat. To save the project several thousand dollars to truck water long distance, a USFS Ranger on the job negotiated access to a pump that filled a water truck parked on the bridge. As they often do, BCHers teamed up with other groups to get this huge job done. This time, they partnered with their familiar friends, the US Forest Service Placerville Ranger District and the Elegant Ears Mule Association. To date, the total value of site improvements is over $105,402, consisting of $39,225 grant funding, $15,071 donations, and $51,106 volunteer labor and in-kind donations. Grants and donations were used to purchase materials, mostly 1,566 tons of gravel. Future improvements being considered by the USFS include a toilet and a source for stock water. Even if the partnership donates the construction, adding these features require maintenance costs in the USFS budget, so additions will depend on public usage and demand. Back Country Horsemen of America is proud to participate in these local partnerships that promote public access to public lands. They commend every BCHA member on their hard work and dedication to the mission of keeping trails open for horse use.